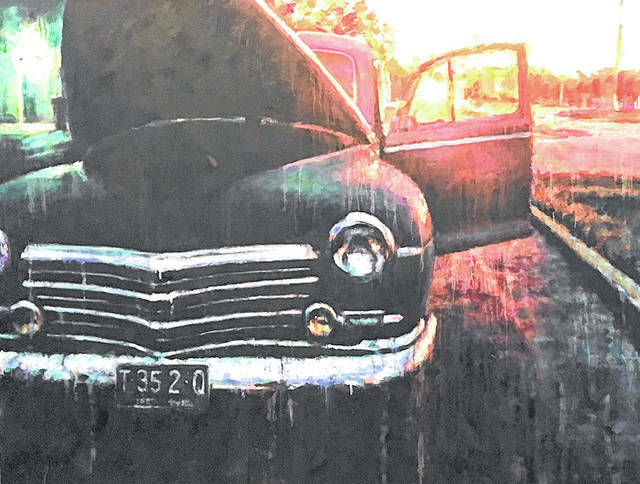 Provided photo Auto expressionist Daniel Brown will display his paintings at Troy Main Street’s Downtown Cruise-In on Friday, April 26. TROY — From classic cars and vintage trucks to newer models, downtown Troy’s public square will be filled with timeless vehicles during Troy Main Street’s Downtown Cruise-In on Friday, April 26 from 5:30 to 8 p.m. Guests can enjoy the displays of Slingshots, Camaros, Corvettes, and more. In addition to the vehicles being showcased, the Cruise-In will offer activities including hot wheels racing and a “Make and Model” matching game. For the art lovers, auto expressionist Daniel Brown will display his paintings near his own classic automobile. Many downtown businesses will also stay open late to welcome all visitors to their stores, and the Miami Valley Veterans Museum will display “history in a box” near a veteran-owned vehicle. Trophies will be given to the top three vehicles selected by visitors and participants. Those who wish to register their vehicle(s) for the Cruise-In can do so by calling Troy Main Street at (937) 339-5455. All vehicles must pre-register. Sponsors for the Cruise-In include ALN Senior Care & Home Services, Alvetro Orthodontics, Erwin Chrysler Dodge Jeep, Excellence in Dentistry, F&P America Mfg., Fairfield Inn and Suites, GNB Troy Banking Center, Heath Murray – State Farm Insurance, Kettering Health Network, KSM Metal Fabrication, Miami County Visitor’s Bureau, Premier Health/UVMC, Unity National Bank, Upper Valley Hearing & Balance, and Western & Southern Life. https://www.dailycall.com/wp-content/uploads/sites/30/2019/04/web1_Daniel-Brown-painting.jpegProvided photo Auto expressionist Daniel Brown will display his paintings at Troy Main Street’s Downtown Cruise-In on Friday, April 26.